Veganismis a type of vegetarian diet that excludes meat, eggs,dairy products and all other animal-derived ingredients. I have replaced sugar with jaggery. 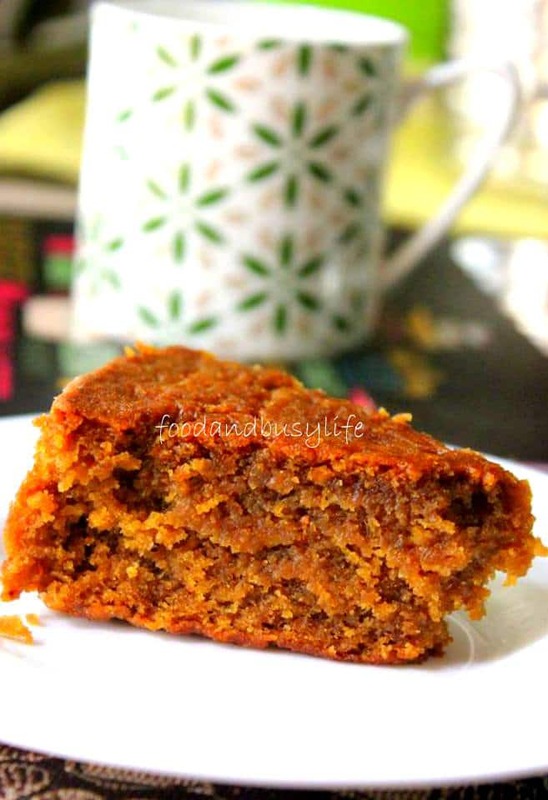 I will suggest to use organic jaggery which makes the cake moist and more healthier giving a deeper color texture and a different taste. Pre-heat your oven at 180 degree C for 10min .Take a 7" baking tin and grease it well with 1/2 tsp oil.Now dust with 1 tsp wheat flour and tap the cake tin so that it evenly dusted. Take a bowl and dissolve the jaggery in water.If its a block than grate it and add in water.Use a spoon to mix it well.You can drain the jaggery liquid in the strainer to avoid some dust particles..
Now take another bowl and sieve the whole wheat at least for 3 times.Now add baking powder, cardamom powder and salt to it and use a rubber spatula or a spoon to mix well. Make a depression in the center and pour the jaggery liquid in it and mix it with a spatula or spoon.Don't whisk or blend it.Just mix the dry into wet .Now mix the oil to it and again don't blend or over mix. Pour into the cake tin and bake for 25-30 min or till it is done.